How important is email to marketing today? What are the best methods of providing personalized messages? And how should companies approach their search for a marketing-technology platform? 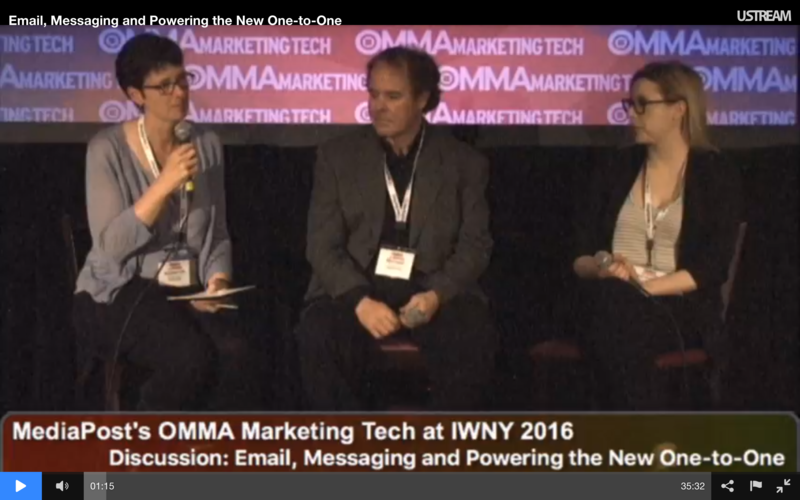 Whatever you do, panelists at the OMMA Marketing Tech Conference advised, don't get caught up in FOMO. Ditch the batch-and-blast emails in favor of the type known to produce a higher return on investment than any other digital medium. At the event, held the week of May 18 as part of Internet Week New York, Ready State Director of Strategy Katherine Ogburn moderated a discussion called Email, Messaging, and Powering the New One-to-One. Here are edited highlights of the discussion. Katherine Ogburn (director of strategy at Ready State): We're going to talk about the best ways to use technology for personalized email marketing. Let’s let everyone else introduce themselves. Mike Ricci (chief marketing officer of Digital Fusion): Good morning. I'm chief marketing officer of Digital Fusion, a Denver-based agency. We serve retail brands like Rack Room Shoes, Off Broadway Shoes, Smart & Final, as well as casual-dining brands like Boston Market and Smash Burger. Our principal focus is on helping them unify all their digital channels. Jacquelyn Wosilius (director of digital marketing at Bowlmor AMF): Hi. I oversee all of digital for Bowlmor AMF. We are the largest owner-operator of bowling alleys in the world, with more than 300 locations across the United States, Canada, and Mexico and a portfolio of brands. We’ve been built up on mergers and acquisitions, so we have quite a lot of different brands in our portfolio and oversee everything from email to display to mobile to social media. Ogburn: Thank you. First question: Is email dead? It's been around forever. Everything else is cooler. Why are we still here? Wosilius: You could probably Google-search "Is email dead?" and find a conference from five, six, seven years ago, when people first started saying it, and people are still saying it, which is really surprising to me. I don't think that email is dead, and I don't think that it will be in the near-term future. Other marketing channels might be cooler, or fancier, or bright and shiny and new. I oversee social media, and I love it. I think it's really fun to work in, but the fact of the matter is, email is always going to be the workhorse of the marketing world. Look at your return on investment. No other channel can provide the kind of return email does. Not display advertising. Not mobile advertising. Not video. It's the backbone of any good, strong marketing program. I spent a large portion of my career at an email service provider, so I've actually been on the vendor technology data side. Email was the first true one-to-one channel. We're getting really fancy in the world of paid social and the world of display, but I think email really blazed a number of trails in that area. It's also a really trusted channel. Ricci: I completely agree. Email is far from dead. It's more than the workhorse. When you compare it, from an ROI standpoint, to all the rest of the digital mediums—if you combine social, mobile, and display together—it still out performs them. Those numbers, in aggregate, still pale in comparison to email. I think what's dead is batch-and-blast emails. Consumers’ appetite for being targeted as a member of a mass segment is over. They're tired of that. They expect you to be relevant and personalized, and to use data to inform both the content and the experience. Where our brands are doing that, they're consistently driving higher returns than any other of their digital mediums. The new toys, so to speak, are really really cool. I spent 15 years in the world of mobile, and God knows I've got a passion for it. But when it comes down to driving a return, a conversion, there's nothing like email, as long as it's designed correctly, and we're using data to inform the experience. Ogburn: Let's drill down a little bit on the idea of personalization and how you can avoid the batch-and-blast aspects of email. Wosilius: It all comes down to data. You can't personalize a message, if you don't know anything about your consumer, so there are a number of different ways to attain more information about your consumer. You could ask them for it, though there's always going to be a low single-digit response for asking a person to give you more information, if you're not incentivizing them. There's another difference between self-reported data and inferred data. A lot of times, people consciously are being honest, and they think they're answering certain questions correctly, but if you actually look at their behavior, they’re not. You might think that you're a consumer of X, but you might not even realize that you actually prefer Y—what you keep going back to, what your behavior indicates. The email world is a double-edged sword. CAN-SPAM and other regulations have helped taken the “free Viagra” spammers of the world mostly off the table, and you really shouldn't be buying shady lists or names, or sending to people who don't necessarily raise their hand and want your product. But getting data can be tough. There are other ways of going about it, in terms of working with large data companies and doing data hygiene and data pens, which I'm a proponent of because these people are your customers. They raised their hands and said, "I want to purchase your product. I want to experience your point of view and have a dialogue with you." When you work with data pens and enrich the data that you have on your database, it's kind of doing the customer a favor. And isn't technology supposed to make our lives easier? It's really annoying when I get an email that says, "Can you please fill out this survey? We promise it's only 15 minutes of your time." My reaction: "Dude. Fifteen minutes of my time is a lot." Sometimes I'm too busy to eat lunch during a workday. It’s better to say, "Oh. She used her American Express at this transaction. We've taken her data, and we know that she uses this Outlook.com address, and she has this Twitter handle and this Facebook profile. We can put everything together and say, “Hey, by the way, would you like to purchase this product that's right in tune with what you want?" If I'm looking for something, and I see an ad for it, a lot of times, it's more of a service to me. I'm like, "Thank you. I was looking for this. Thank you for this reminder." Ricci: Personalization has become one of the greatest buzz words in our industry, and unfortunately, it means different things to different people. To some of the marketers we work with, at a native level, they believe that personalization is as simple as knowing my name and personalizing the email with it. There are two key data streams. Preference data is the first: self-declared user data and behavioral data, off the analytics of websites, and engagement with either content or products. The more important one is transactional data, which tells us more about the consumer than anything else. If I understand your purchase behavior, your pricing propensity, and I can use that to inform offers what to send to you, you are far more likely to act on and redeem them. That's how we drive higher ROI from email. We make it more relevant for the consumer. We personalize dynamic content. True one-to-one personalization invariably means breaking down data silos and being able to tie into your CRM instance, your loyalty database, your e-commerce platform, and more importantly the customer's transaction. If we can build that unified profile of the consumer, then we can truly drive what we're calling one-to-one personalization. Absent of that, it's nothing more than name personalization. Ogburn: How do the pursuits of effectiveness and ROI change the level of personalization that you want to invest in? Wosilius: I think that everyone on the brand side experiences a little bit of FOMO (fear of missing out), when it comes to technology tools and fancy machinery and algorithms. They think, "What could I be doing that I'm not already doing, in terms of my customer? There's an investment behind that. It might cost me hundreds of thousands of dollars to implement a really true data platform that's tying all the data together and messaging that person, but ROI will be considered in that decision. I would recommend to brands to kind of start small. Use the data that you have, and selectively append that data. Always ask, “How am I driving incremental sales based on what I would have been doing without this extra layer of technology?” It's very easy to sign on a ton of vendors, and to just buy a Ferrari and hide it in your garage because you don’t drive a stick. You don’t want to have to ask, "What am I going to do with this vehicle, if I don't have anyone behind the wheel who knows hot to drive it?" A lot of people who use these complex technologies spend the majority of their time just instructing people of what it is and how to use it, not necessarily actually using it. From an ROI perspective, transactional data is fantastic. Use what you have about the consumer, and always be mindful of the delta, the business case. Ricci: I completely agree. It's really easy to get lost in the allure that is technology: “We're a Salesforce marketing cloud partner.” “We're a Demandware partner.” “We've chosen some of the best technology in the marketplace.” However, technology in and of itself is not going to accomplish anything, if it's absent of a strategy to drive it, if it's absent of the right people to execute on that strategy. The brands we serve have one common attribute: They’re preciously thin, either from an IT standpoint or from a marketing-execution standpoint. Wosilius: I'm actually not completely sure if this is an urban myth or whether it actually happened, but I heard a story years ago about a brand that had a great database with all of these great customer profiles and segments, and was sending an email to its list. Instead of custom-publishing the first names of the recipients, they accidentally custom-published the name of the segment that that person was in. It read something like, "Hi, affluent white male. Would you like to buy our product?" You can invest tons in technology and building up segments, but you also have to know how to use it effectively. Ogburn: If I were evaluating an email system, what would you tell me to look for? Which are the more powerful and convincing tools, in your experiences or conversations? Wosilius: My company is actually in the middle of an ESP RFP (email service provider request for proposal) right now, funny enough. We're in the finalist stage. We're looking for companies that have a strong technology stack, a strong product road map, and a great professional services offering. Your tool is only as good as how well you know how to use it and how well your vendor is at enabling or helping you to use it. When I was on the ESP side, I had some clients that never logged into the tool because my team did everything for them. These days, ESPs are really turning into MSPs (managed service providers). They have one platform for sending your email, setting up your display, sending text messages, and following a person on Facebook. I think that's really cool. One thing on the client brand side I'm a little wary of is, a lot of times agencies and companies say they can do anything—they're a jack of all trades, master of none. Others are like, "We do one thing, and we do it really well." Certain service providers try to do too many things, and they might have a really strong offering in email, but the email experience is completely different than the mobile experience. It's not intuitive. So it’s important to really vet whether they can do what they're claiming to do in a really good fashion. Ricci: Jackie hit it on the mark. She comes out of our space and obviously understands the technology end of things. Most marketers don't. They're confused by the technology and by the claims of all the providers. Anybody out there looking for a platform should find a provider that can be Switzerland, that understands the technology, but more importantly that can implement it and integrate it with all the rest of your systems. Find a partner who you can pull close, who can help you break those data silos down and make sense of the technology. Pick the right technology for you. Not everybody needs marketing cloud; it's far more important to really focus on who's the agency partner. Software companies are good at selling software. Salesforce didn't get to be one of the world's largest technology companies by accident. It got there not only by inventing good technology, but by selling it and then continuing to focus on upselling the suite. Again, buying technology for technology's sake is not a winning proposition.